HMF have continued their longstanding working relationship with Rich Products having just completed some further steel partitioning fit out work at Rich Products’ site in Porchester. Hampshire Mezzanine Floors originally started work for Rich Products when it was formerly known as David Powell Bakeries and HMF were main contractor for their first site at Speedfields Park in Fareham. David Powell Bakeries had been much valued clients’ for many years until leading American company Rich Products took over the Speedfields Park site. Since 1945, Rich Products has been dedicated to developing food solutions that raise the bar on quality, convenience and efficiency for its customers. 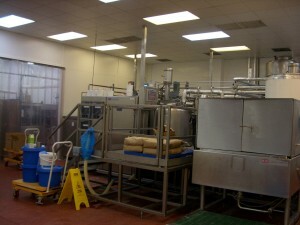 The project at Porchester involved modifications to an existing food preparation area that Hampshire Mezzanine had originally constructed some 10 years ago and the reason for the project was to allow Rich Products to carry out modifications to their food production processes at the site. 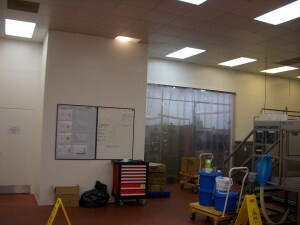 The partitioning provided was a double skin steel partition system built four metres high in a painted finish. The work included the relocation and refitting of some partitioning including sliding doors and single side hung doors as well as the introduction of new doors and partitioning areas. The doors had perplexed vision panels within the doors to give good visibility of internal areas.